DK Publishing has produced yet another wonderful resource for Star Wars fans with Star Wars: The Visual Encyclopedia. It doesn’t take long to realize that the work put into this book by Tricia Barr, Adam Bray, and Cole Horton (along with a wonderful editing and design team) is some of the best resource material created for Star Wars fans. Star Wars: The Visual Encyclopedia covers everything imaginable in Star Wars. There are sections on clothes, weapons, planets, ships, species, you name it. It feels exhaustive and that is a beautiful thing to say as a Star Wars fan. This impressive collection of information even has subcategories of almost everything. For example, there are not just entries listing creatures in alphabetical order but aquatic creatures, aerial creatures, space creatures, etc. It is most impressive. With a book with this much detail, it could easily be cluttered with images in foreground and background. The designers made a simple, but an insightful decision in having a white background on almost every page. The images of blasters, characters, and ships pop off the page and are easy on the eyes. All images are clear and detailed. You can spend large amounts of time on a single page alone without being overwhelmed by it. A lot of that has to do with the design. 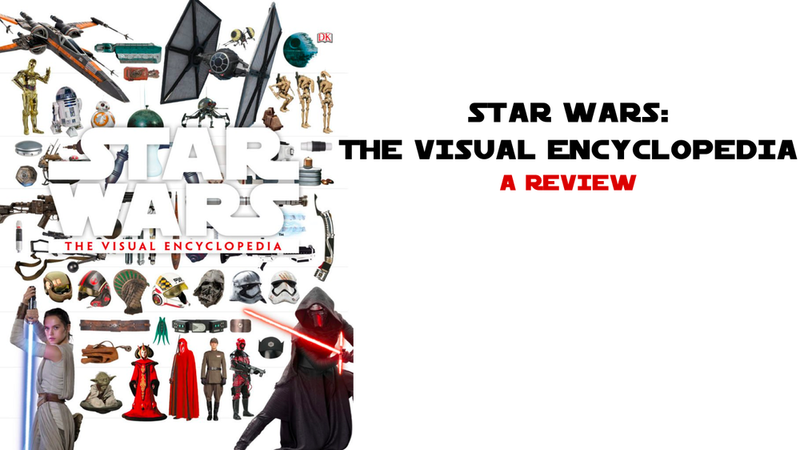 Throughout The Visual Encyclopedia, there are references to the Star Wars story. It is not just the details of a device or planet. The entries in the book also reference how the items tie into the story of Star Wars. For example, when you read the entry about the Sarlacc, it refers to how the one on Tatooine in Return of the Jedi was injured when Jabba the Hutt’s sail barge exploded. While many entries tie into the greater Star Wars story, there are also sections of the book that provides timelines, details about the politics at different time periods of the saga, as well as wonderful insight into those involved with each faction. There are many little details throughout the book that are a treat to see. Do you want to know how big the Millennium Falcon is vs the Sando Aqua Monster from The Phantom Menace? It is in the book. Do you want to see the rank insignias of the Resistance? It is here for you to memorize as you create your next cosplay ensemble. In every corner, nook, and cranny the Visual Encyclopedia has something to explore and discover, and to be honest that is one of the most delightful things about this book. With the continuous release of new Star Wars material, this is a question worth asking. When will the Visual Encyclopedia be outdated? I think that is what makes this book so surprising. There is such a wealth of information contained in this book that I find it hard to not recommend it. While there will be new stories that are released consistently in the foreseeable future, there are many things that are fixed and unchanging in the Visual Encyclopedia. From species types to creatures to planets to weapons, there is so much here that will not change and I think that is important to realize as you consider buying this excellent resource. Because of its beautiful design, amazing attention to detail, connections with the Star Wars story, Star Wars: The Visual Encyclopedia is worth having on your shelf or coffee table. You will not be disappointed. The Visual Encyclopedia will be out on April 4, 2017.